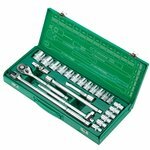 Wrench sets for work with different sized bolts. Single handle that is compatible with a large number of attachments helps to save space on the desktop or in the bag. Ratchet mechanism allows speed up the work process and add torque with the same effort by the repairman. 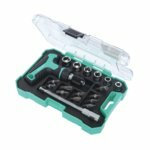 Tool kit (27-in-1, 1/4"): interchangeable sockets and bits with ratchet handles in a durable plastic case. 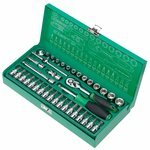 Handy, all-in-one 40-piece ratchet set! Featuring dual-color rotatable rachet handle. Chrome Vanadium Steel bits. 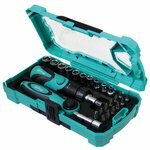 Tool kit (26-in-1): interchangeable sockets and bits with ratchet handles in a durable plastic case. 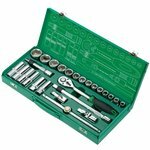 Socket set for equipment assembly, maintenance and general industrial service. All parts are made from chrome vanadium steel and bright chrome plated. Supplied in a strong plastic box, with a transparent cover. 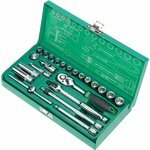 Handy all-in-one set of tools (35 pcs. ): bits and sockets with a ratchet handle and long-nose pliers. T-handle with ratchet design. Quick release chuck. Includes essential bits and sockets. 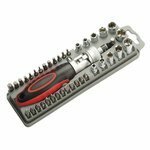 A set of interchangeable sockets with a holder and a reversible ratchet handle (38 pcs.) in a rigid metal case. The tools are made of chrome-vanadium steel and meet the european standard. 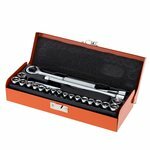 A set of interchangeable sockets with a holder and a ratchet handle in a steel case. The tools are made of chrome-vanadium steel. 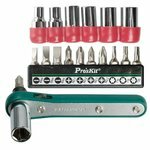 A set of interchangeable sockets with a holder and a reversible ratchet handle (24 pcs.) in a rigid metal case. The tools are made of chrome-vanadium steel and meet the european standard. 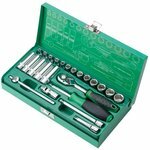 Tool kit (22 pcs.) 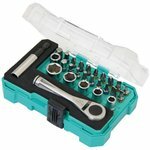 with interchangeable sockets and bits with ratchet handle in a durable plastic case. 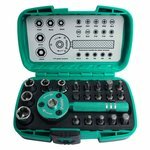 A set of interchangeable sockets with a holder and a reversible ratchet handle (26 pcs.) in a rigid metal case. The tools are made of chrome-vanadium steel and meet the european standard. 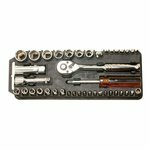 A set of interchangeable sockets with a holder and a reversible ratchet handle (23 pcs.) in a rigid metal case. 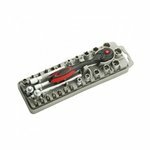 The tools are made of chrome-vanadium steel and meet the european standard.